Do Neon Tetras make good tank mates for male bettas? How many can go in a 10 gallon aquarium? A: Neon Tetras (Paracheirodon innesi) may make good tank mates for your male Betta if the circumstances are right. The basics for success are already there. Both neons and bettas enjoy similar water parameters. They thrive in a tropical tank with a slightly acidic pH, soft to moderate hardness and a temperature between 75F – 79F [24C – 26C]. Neither bettas nor neons do well when exposed to ammonia or nitrite and neons are especially sensitive to poor water quality so a cycled tank is a must. The most important thing to address with neon tetras are their social structure. Neons are a shoaling species and must be kept in groups for long-term success. Schools smaller then 6 tend to suffer stress induced illnesses so plan on keeping several at a time. In a 10 gallon [38 liters] with one male betta you can safely keep 6 – 8 neons with good filtration and weekly partial water changes. Because you are looking to house your neon tetras with a male betta specifically, there are a few other things to consider as well. First, it’s best to avoid adding neons to a tank with a betta who is known to be overly aggressive. As you probably know, individual male and female betta personalities can range from the timid to the outright belligerent. If your betta has a bad reputation you may want to concede to his desire to go solo. Even if your betta is willing to play nice with others, it is highly recommended to choose only individual neons of a healthy adult size. Very young or small neons have a habit of being confused with dinner. Aim for companions that won’t fit in your betta’s mouth. When choosing neon tetras, look for fish that are swimming with the group, have vibrant coloration and are all around healthy in appearance. Avoid fish that may be hiding, lethargic, showing signs of disease or are misshapen. Neons are notorious for not shipping well so ask your LFS when they arrived. If they just came in, give them a couple of days to develop any illnesses. My local PetCo is good about telling it’s customers when the neons have just arrived because they are familiar with the problems that develop. On occasion they will even put a hold on selling the fish until they have acclimated properly. 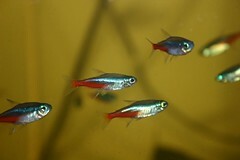 Neons are very prone to Ich and Neon Tetra Disease. I always caution aquarists to quarantine new fish for a minimum of 4 weeks but I emphasize it even more so with these fish. Because a change in water parameters fuels stress induced illnesses, I recommend acclimating them to their quarantine tank using the water from the Betta tank that will ultimately be their final destination. This way they aren’t exposed to the stress of acclimating to the store water, the quarantine tank water and then the final aquarium water all within a month. Neons are gorgeous little fish and are fascinating to watch. Personally, they are my favorite of the common shoaling fish and look absolutely amazing in a tank with dark substrate and live plants. Good luck and I hope you enjoy the addition of neon tetras to your aquarium. To learn about other Betta splendens tank mates visit the Tankmates page at Nippyfish.net. I just put some tetras in with my Betta and watched my Betta go all Kill Bill on them. I know have a tetra with one eye. I had to buy a new tank to keep them in…and alive. Don’t do it! Depends on the betta personality- I have 8 neons in with a female betta- half of which were intended to go in with my second female betta. Female #1- very timid personality, completely leaves them alone. Female #2- thought the neons were dinner, had to rescue them. She is A LOT more aggressive than #1. So I gave her two mollies, and while they don’t like each other, there isn’t more than the occassional small nip. Thank you for sharing your knowledge and expertise on neon tetras. I have learned much valuable information from your website. I have some neon tetras coexisting happily with orange tetras, flame tetras, guppies, blue danios, glass shrimp and one double tail male betta. They all seem to be doing fine together. My male betta, Doewy seems to keep out of the way of the reset of these fast moving fish. The neon tetras are truly a remarkable sight especially with their flashes of color as they swim with the other colorful fish. For later reference, I have organized your website and other related websites that I may need later. I love Neons too. Though small, they are great looking fish. I love how they contrast in a well planted aquarium. Beee-u-tiful! I got a bunch of neons tetras last night and introduced them to my big betta. There were only nine this morning. I don’t know how it happened. I don’t know when it happened. Are neon Tetras good tank mates with Black ghost knife fish. I had a school of 6 neons in a 10 gallon with my male betta. The neons were totally nipping away at the betta’s fins! I gave the neons away to some guy on Craigslist. Then I got five ghost shrimp to go in the tank. I came home on Christmas day to find one of the shrimp latched on to my betta and eating his fins. I flushed them down the toilet. Now the betta’s fins have started to regrow and I am trying two ADF in his tank. Hopefully this relationship will have better results! Yeah, don’t flush live creatures! You should not keep an aquarium if you aren’t prepared to maturely handle the risks. It’s inhumane and risks introduction of an invasive species. Read up on ways to humanely euthanize aquarium creatures, or even better yet, join a fish club, or get on a good rapport with your local LFS so that you can rehome or donate any fish or inverts you don’t want. i have 8 neon tetras with my halfmoo double tail betta, he chases them around occasionally but cannot get them. ne of them lost its eye, idk if the betta is gulty though. ugh well they seem fine.. should be worried? In my tank I have 3 glass catfish, 2 female siamese fighting fish, 3 albino barbs, 1 platy, 1 male fighting fish, 2 malwais, 1 rainbow shark, 3 neon tetras, and a few snails, and I’ve had it running for about 8 months and everything has been fine, just got to get them used to each other slowly. I have two beautiful betta fish(different tanks of course). Thorn, is a Crowntail and is relaxed and mostly mellow but hated my Ballon and Dalmation Mollies; had to get rid of the mollies and it makes me feel horrible for it. But he has several bottom feeder tank mates and one little fish with black on his sides and a point tail fin named Spot. Then there’s my beautiful, cranky Rogue the Halffmoon Betta. I love them all to bits. Maybe I’ll try Neons next. I don’t have experience with betta’s specifically in this area, but I do have experience with territorial fish in saltwater and the order you put them in the tank matters for best success. You always want to start with the least aggressive fish first, and let them get established. So you want to put the neons in the tank, let them get acclimated well, etc. Then you add in the betta. Then the betta will(hopefully) allow them in its territory and accept them. Otherwise, the beta is going to think of the tank as his territory and all you did was add intruders to it. It’s going to be more difficult for them to accept them into its territory. Temperament matters, but you’ll find much higher success rates by adding less aggressive fish first. I’ve had a betta for about a year now, added 6 neon tetras and everything seemed to be going fine, but the 3rd day I woke up to 5 dead tetras floating on the bottom of the tank. Not sure if the betta is to blame or not.